UDM Downloads > Virtual Serial Ports Driver! Virtual Serial Port Driver by Virtual Serial Port Software, department of Eltima, is a sophisticated software solution aimed to create two pure virtual serial ports virtually connected to each other in your system. Therefore, without additional hardware installation you may use extra serial ports emulated at your computer. Deploying virtual COM ports you can do the same you do with the real one and for other windows applications they will be seen exactly as two real serial ports connected via null-modem cable. Unlike standard physical serial ports, virtual ports can be assigned any number and you can create as many virtual serial port pairs in your system as you want. The only limitation is the performance capacity of your system, as it may require a substantial amount of resources to emulate a lot of serial ports on the slow computers. VSPD XP emulates all serial port functionality and provides you with full support of Hand Flow control. In addition you can set custom pinout, apply line connection break and get complete information about virtual serial port condition. For example, you can create virtual pair COM6-COM7 and connect one application to another using it. In this case all data sent by other applications to COM6 will be supplied to COM7, and all data sent to COM7 will be supplied to COM6. This will ensure data exchange between applications. Such feature can be used for GPS simulation programs. In comparison with a real port a virtual serial port can be easily configured in accordance with your requirements. VSPD XP could be easily integrated into other software installations providing bundled software distributions. OEM version of VSPD XP enables the developers to control virtual serial ports directly from their own applications. On-the-fly installation makes VSPD XP presence invisible for the end-users. 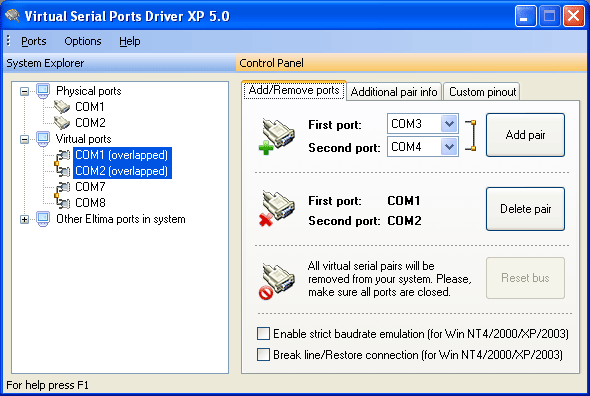 User friendly interface makes it very easy to configure and use virtual serial ports pairs.